Let's face it, life is stressful. It's nearly impossible to do something for yourself, especially when you're a parent or a full time worker or even both! It's time to start doing what you want to do in 2018. At Envision Medical Spa we have joined forces with Syneron Candela to offer safe and effective treatments all while giving our patients a chance to win outstanding prizes! Syneron Candela invites you to enter a chance to win an ultimate getaway with treatments using a Syneron Candela Products as part of 'It's All About Me in 2018 Sweepstakes'. When you have a Syneron Candela treatment performed on you up until April 15th you will receive a certificate of authenticity. You will need to complete an entry form online using a unique code that is found on your certificate. The best part is that there is no limit on how many times you enter this amazing contest! Let's say you have three treatments, that is three chances to in! The grand prize winner of the "It's All About Me in 2018 Sweepstakes" will have their choice between three destination getaways - Maui, St. Lucia, or Sedona. The winner will embark on an eleven day/ten night dream vacation with air and ground transportation, as well as hotel included! Ten additional winners will be picked to win a $500 American Express gift card - allowing you to do what you want to do! You have until April 15th to enter, the lucky winners will be drawn on April 20th! 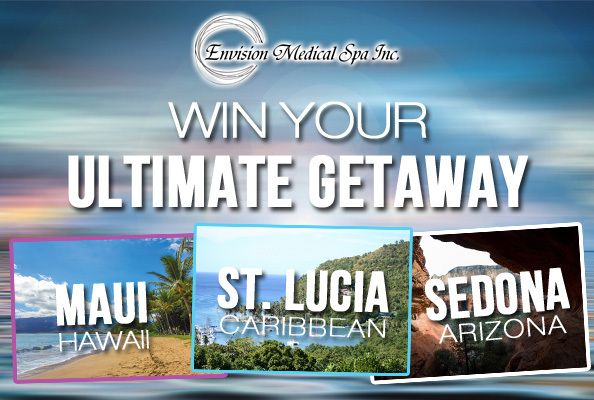 Envision Medical Spa offers different types of treatments that can enter you to win your ultimate getaway! We offer all treatments that are performed by the Gentle Max Pro (G-Max Pro) and the Sublative. Whether its hair removal, skin tightening, removing of spider veins or acne scars, you will receive your certificate of authenticity! Syneron Candela wants to help you go where you want to go and do what you want to do in 2018 while also focusing on your best health! Let Envision Medical Spa help make this year, your year. Book your free consultation to discuss what your unique treatment options are by calling 780-986-8352 or drop in and say hello at #103 5101-50 Ave, Leduc, AB.